← Help Native Plants Thrive! Volunteers enjoying the great weather and food at the Blue Rock Springs Park BBQ. 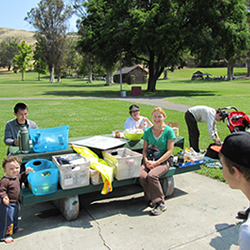 On Saturday, July 21, from 9 a.m. to noon, we’ll be meeting at Blue Rock Springs Park (650 Columbus Parkway) for a cleanup of the lake and celebratory BBQ. Each year, the Alliance recognizes and thanks our volunteers with an easy morning in the park, followed by burgers, veggie burgers, hot dogs, and all the fixings. Join us for the cleanup or just for the BBQ at 11:00 … either way, you’ve earned it! RSVP to Info@VallejoWatershedAlliance.org or 707.652.7812.